Porto Alegre, Brazil, is Brazil’s fourth-largest metropolitan area and the largest city in the Brazilian state of Rio Grande do Sul. The city is also one of 12 in this football-mad country that will host coveted FIFA World Cup matches in 2014. With Tina Leme Scott and Andre Maceira, escorts from Embartur, the Brazilian Tourism Board, I walked out of Salgado Filho International Airport Monday under gray and rainy morning skies to join a small group of media for a week-long tour of the city’s World Cup stadium, tourism infrastructure and historic and cultural sites. Early in the 15-minute drive from the airport to the Hotel Laghetto Viverone, Andre pointed out construction along the roads and buildings as World Cup preparation work. The work is responsible for increased traffic congestion around the city but is obviously necessary, said Andre. Our hotel is set in the city’s Moinhos de Vento district, named for the windmills built here by 18th century Azorean immigrant settlers (“moinhos” is the Portugese word for “windmill”). As the story goes, the building of tramway in the 1890s led to the development of Moinhos de Vento, along which wealthy families built residences. The neighborhood remains an upscale area of Porto Alegre, and our hotel is in fact located in a cleverly designed, government-protected mansion with a modern hotel extension added to its rear. 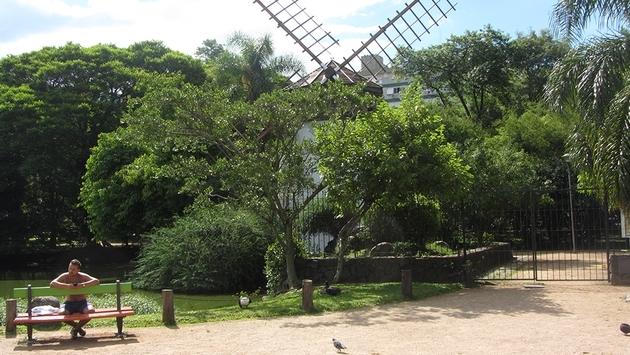 As we strolled around the leafy and tranquil Moinhos de Vento Park (pictured above), the sun began to peak out. 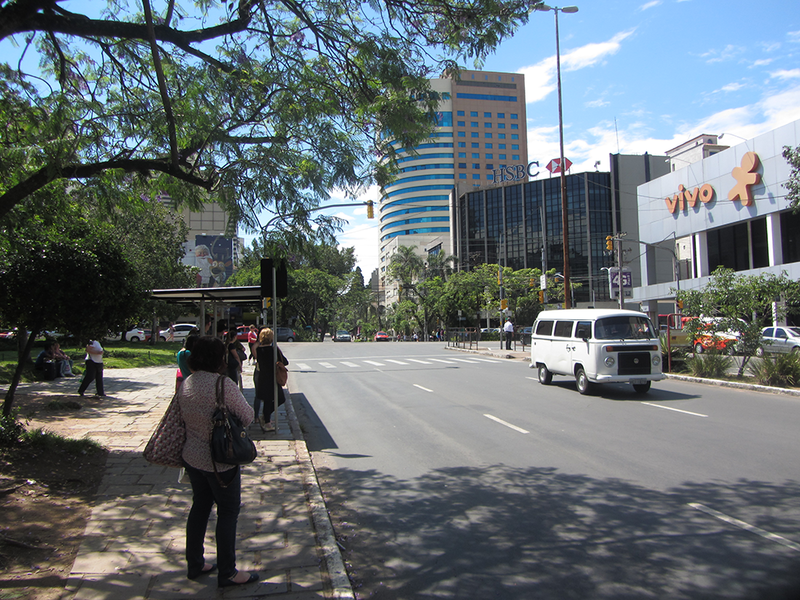 Another local guide, Marcelo da Silva, explained that because Porto Alegre has long been home to a wealthy and educated class, the city’s roads and infrastructure are in good shape and require relatively minor work on roads and public buildings in preparation for the World Cup. In fact while there are construction sites all around the city, none seems to be a large-scale project other than the building of the new stadium, just minutes from Mohinos de Vento, which will host this city’s World Cup matches. Based on the attractions found in Moinhos de Vento, World Cup visitors in the city will find a wide array of things to do beyond the games themselves. Mohinos de Vento has a sophisticated and diverse collection of restaurants, cafes, bistros and nightclubs. The city offers 70 hotels, 35 of which have been built in preparation for the World Cup, and is home to the first fine art museum in this section of the country. There will be public festivals, rodeos and other special events for the public as the World Cup draws closer. The sun had emerged fully by the end of our stroll, and Marcelo revealed that the cities surrounding Mohinos de Vento share its diversity, with diverse gastronomy, historic buildings and artsy Bohemian districts. There would be plenty to do and see around Porto Alegre even without the World Cup events. But of course the World Cup will come to this city in June. FIFA officials will announce the World Cup match schedule and locations on Friday. In my next dispatch from Porto Alegre, I’ll discuss the new stadium and what the World Cup experience will mean for this major Brazilian city.